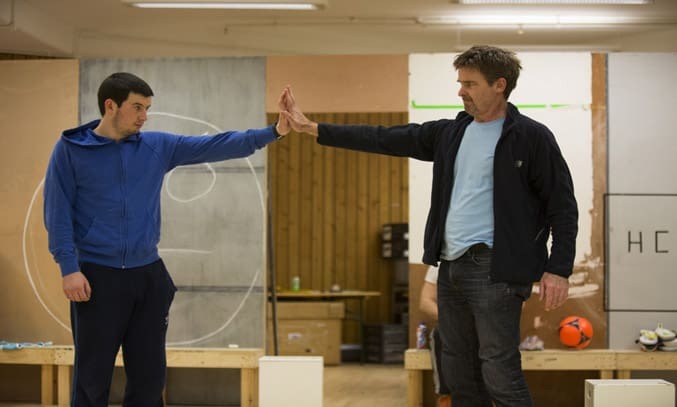 Following a successful tour in 2015, the National Theatre’s internationally acclaimed production of THE CURIOUS INCIDENT OF THE DOG IN THE NIGHT-TIME makes a welcome return to Salford’s The Lowry this week as it embarks on a second UK tour. The innovative drama based on Mark Haddon’s award-winning novel tells the story of Christopher Boone, a fifteen year old boy with an extraordinary brain but ill-equipped to interpret everyday life. When his neighbour’s dog is found speared with a garden fork, Christopher is under suspicion. Determined to solve the mystery of who murdered Wellington, Christopher embarks on a journey that upturns his world and questions his relationship with those closest to him. Ahead of its opening on 21 January at Salford’s The Lowry, Frankly My Dear UK caught up with David Michaels who plays Christopher’s father Ed Boone. The Wilmslow and Manchester educated actor, whose previous credits include TICKING at Trafalgar Studios and THE DISHONOURED (UK Tour) as well as voiceovers for Lucozade Sport, Fairy and Renault, is relishing the opportunity to be a part of the Oliver and Tony award-winning production. “I read the script and thought wow, what an amazing script. It’s so spare, it’s so poignant, harsh, believable, truthful, sad and funny” comments Michaels, in an exclusive interview with Frankly My Dear UK. Michaels plays Ed Boone, a single parent struggling to juggle everyday life whilst holding together a strong relationship with his son, who has an autism spectrum condition. Like Christopher, Ed is complex character who also has to cope with some big changes in his life. “This play takes place in a two year time frame but if the play had started three years ago you would see a completely different Ed” explains Michaels. Striking the perfect balance between understanding and anger which Ed experiences is certainly a challenge. “His [Ed’s] first half and the second half are quite different” comments Michaels. Yet despite the strained relationship between Christopher and his father, Michaels believes the play is incredibly hopeful. THE CURIOUS INCIDENT OF THE DOG IN THE NIGHT-TIME opens at Salford’s The Lowry on 21 January and is on tour in the UK until September 2017.